While the likes of Mario and Zelda get all the plaudits, the best game on the SNES was Pilotwings. 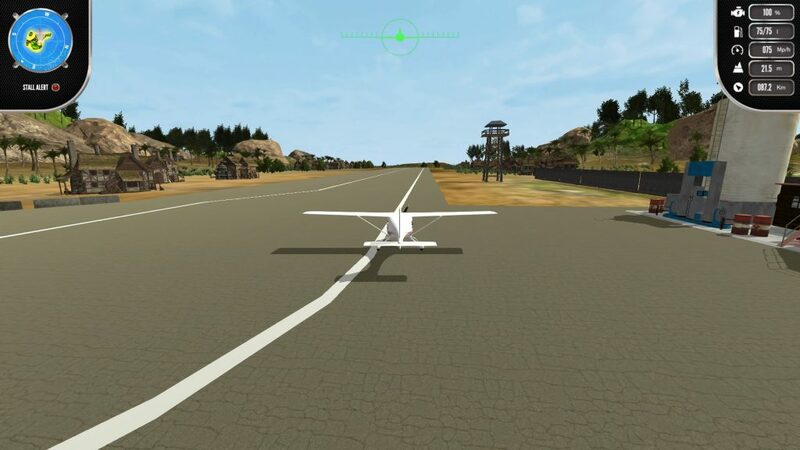 Flying around that beautiful green island was a joy and so we were pretty keen to try out Island Flight Simulator, which definitely has some parallels to the 16-bit classic flight game but, crucially, a lot of differences. And by differences we mean stuff that is missing. 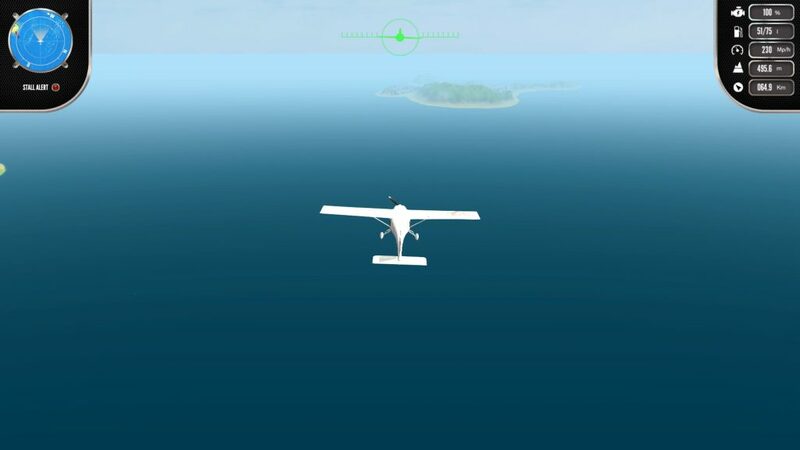 The game has you playing as a nameless pilot (actually you are named in the game after your PSN identity and can’t change it) based in some sort of ocean location. In the game’s relatively compact map there are twelve little islands. You start on the main island and here you can upgrade and fuel your plane and take job assignments. These all behave the same way. Fly to one island, pick up your cargo, fly it to another island, pick up the cash, go back to the main island to refuel and get your new job. That’s it. You can spend money on new planes and upgrades but the flying is always the same. You press X to turn on the engine, RT to accelerate and pull back on the left stick to get airborne. After that you pretty much point yourself in the right direction at which point you’ve got a bit of a wait as the plane coasts to your destination. You could leave the joypad on the sofa next to you but your plane has a weird habit of automatically pitching upwards which ultimately makes you stall (but you can save yourself pretty easily). Aside from that though, you may as well be on autopilot. The only trickiness comes when you arrive as it is quite possible to mess up your landing. It’s actually pretty forgiving when it comes to the impact of landing, the only real danger comes from not having enough time to brake and stay on the runway. That said, crashing is pretty rare. So really what you get is just those airplane stages from Pilotwings but without the rings to fly through or any kind of scoring based on your landing. It’s essentially a big series of fetch quests but without anything in your way and to make things worse, the early missions all take place on the same three islands so you’ll be doing literally the same thing for hours until the missions extend to the other islands. It probably couldn’t be less dull. Later on you can choose to transport contraband but the only peril here is that you may get ripped off or caught which means you won’t get paid. Essentially then that just means you are wasting time. With such simple gameplay you’d at least expect the game to be well put together but it is pretty poor. Right away there is a lack of quality that seems to run through the whole game. You start on foot and the walking is incredibly slow (and backed up with spot sound effects that sound like you are wearing tapdancing shoes). It feels like you are exhausted. Once in the air, the game really struggles for performance. Given that the area is 95% water (which is clearly a load of flat textures with very basic water effects) and the islands are very small and basic, it’s a real surprise to see my PS4 Pro struggle for framerate. There’s just a lack of smoothness to it all. Pretty much any open world game on the PS4 that allows flying will have better graphics, more detailed environments, faster flight and better graphical performance than this. In fact if you compare this to GTA5 on the last gen consoles, this handles pretty badly. It’s all a bit unforgivable really. Most crucially, the flying also disappoints. There’s no sense of excitement to it. You can’t soar and swoop like you can in most flying games. Sure, those games put you in fighter jets where as this one puts you in the sort of plane that you see in films where a guy says “wait… this is your plane? !” but even so, we expect a bit more from a game where the only thing you can do is fly. It’s buggy too. Sometimes the plane just spazzes out for no reason and, worse, I’ve managed to get the nose of my plane stuck in the runway. Like over a foot in. I was still able to speed up my nose propellor (which was buried in tarmac) and turn off the engine but I couldn’t crash or get out of the plane. The screenshot below shows it. 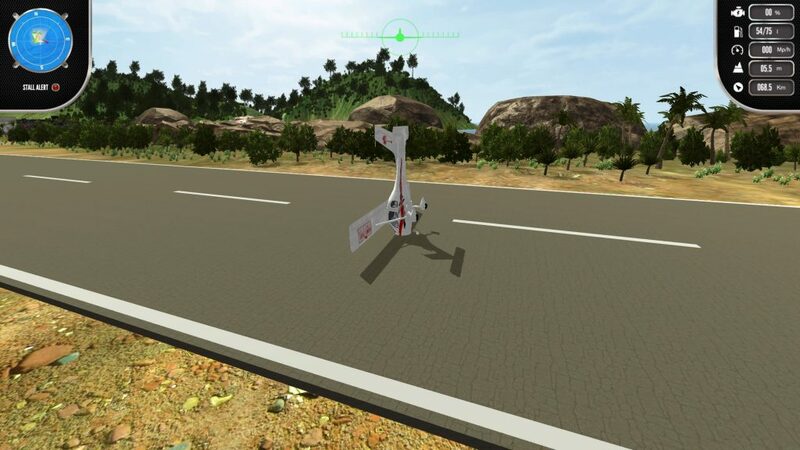 In the end, it’s hard to know why Island Flight Simulator even exists. There are a handful of relatively easy things the game could do to make it more interesting or at least more convenient. Why can’t I queue up multiple jobs? Why isn’t there an Elite style trading system? Why not base your job rewards on performance? If they threw in a few rings to fly through and maybe target zones on the runway, it’d at least add something. But instead you’ve basically got a game that is so bare-boned, that you’d imagine this is the kind of thing they put together to test the flying physics in bigger, proper games. Island Flight Simulator doesn't do very much and what it does it doesn't do very well. This game is not worth the time or money………. 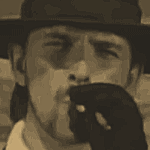 The game will crash every time after you reach the 2nd plane level……. I just spent weeks building up $20k+ and did all the ugrades, did one more flight in original plane then upgraded plane. New plane starts and revs up but will not leave hanger! To say I am annoyed would be an undertatement! I just spent weeks building up $20k+ and did all the ugrades, did one more flight in original plane then upgraded plane. New plane starts and revs up but will not leave hanger! To say I am annoyed would be an undertatement1 Anybody any ideas? All true! But I only paid $18 for it, so I wasn’t expecting the quality of a $60 game. I’m getting my $18 of fun from it. I’m still on the 1st plane so I haven’t experienced the problems I’ve seen in other comments. If that’s true…perhaps they will come out with a patch to fix the bugs soon. $18 is too much for it. There’s no fun to be had at all. Some real problems with the game. if you upgrade the first plane, stork, to the maximum fuel tank and power you can not complete even the shortest pick up and delivery with out running out of fuel. Next, when I acquired the second plane it had the same problem with the maximum power upgrade. It is also supposed to be able to fly to the other more distant island. Wrong. Last of all I upgraded, the second time around, the fuel tanks to the maximum size tanks and was now unable to refill the tanks. The refill button grayed out. I then upgraded to the 3rd plane, and although I could upgrade the fuel tanks and power on the 3rd plane I was still unable to refill the tanks or fly to the other islands. I would get a CE-34878-0 error code or would receive a message that said something like I was out of the designated area. The sad part is the third plane, Avonza I think it was, was the most fun to fly. I can’t believe this app went to market with these kinds of problems. Trying to reach some to get technical help is all but impossible. Absolutely loved Pilotwings, and my favorite part of GTA is flying about in planes, so disappointed this is such garbage!